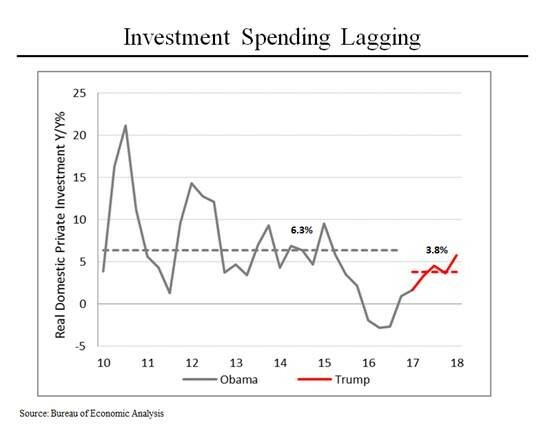 On MSNBC’s Morning Joe today, Steven Rattner discussed that contrary to Trump’s pronouncements that the economy is booming, several key metrics lag the performance of his predecessor. How strong is the economy? President Trump says far better than under President Obama; the data suggests otherwise. Let’s start with job growth. Since the dark days of the financial crisis and ensuing recession, the nation has added jobs every month since October 2010. (Obviously, there has been considerable month-to-month variation.) 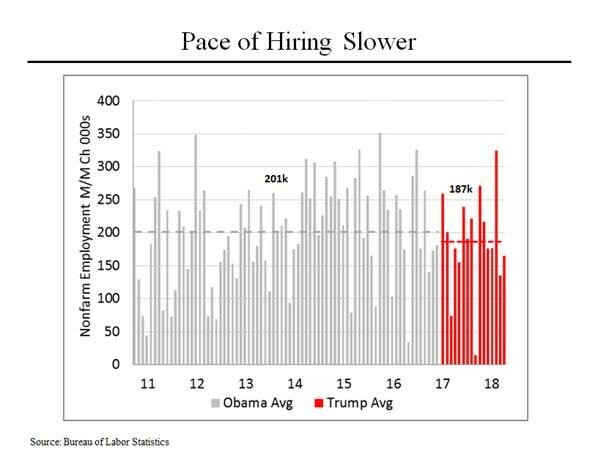 What’s worth noting is that the average number of jobs added each month has been modestly lower since the Trump Administration began – 187,000 jobs per month since the beginning of 2017 versus 201,000 jobs a month since the economy bottomed. More disappointing has been the performance of wages, which historically increase faster as an economic recovery gathers speed. That has not been the case this time around. 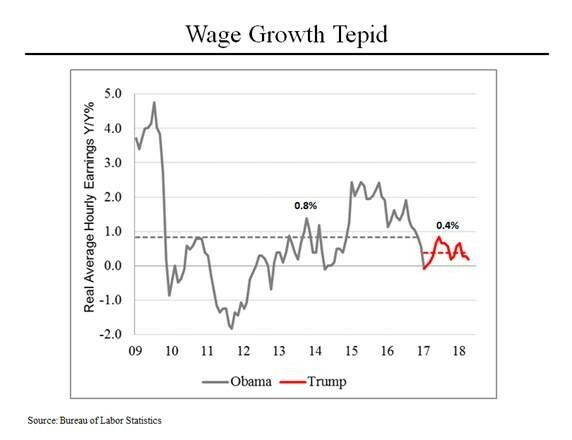 Under President Obama, average hourly earnings (after adjusting for inflation) grew by 0.8% per year; so far under President Trump, they have grown by half of that amount. That is particularly surprising with an unemployment rate of just 3.9%; tight labor markets generally allow workers to win larger pay increases. Why is it different this time? The reasons are complex and varied and include globalization, weaker unions, tougher management by corporations and the lack of growth in labor force participation, particularly on the part of “prime age” men, those between 25 and 54 years old. Back in 1960, virtually all prime age men were in the labor force (ie., working or looking for work). 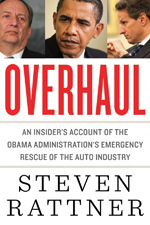 For a variety of reasons, that dropped steadily, reaching a low of 88% in 2015. Since then, it has climbed to 89.3%. 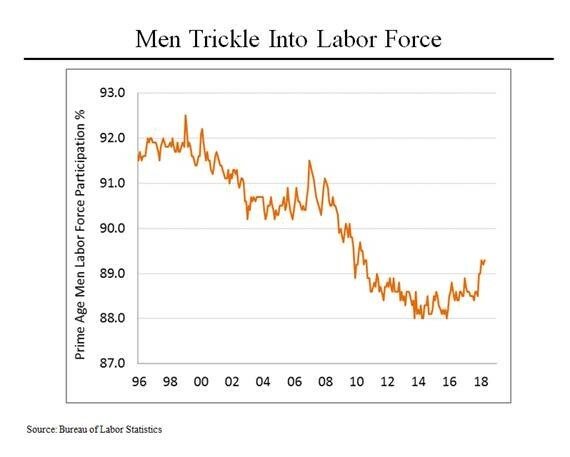 That may not sound like much, but just for this category of individuals, it’s roughly 700,000 more men looking for work or employed. As he did with jobs, President Trump has repeatedly argued that his “business-friendly” administration would lead to greater investment, particularly with the passage of the Republican tax cut plan. That could possibly occur – but it hasn’t happened yet. Going back to the nadir of the recession, investment spending grew at an average rate of 6.3%; since the beginning of 2017, it has grown at a 3.8%.